Did you know that exponents are just a quick way to show repeated multiplication? In this tutorial, see how to expand out a value in exponential form to see what it really represents! 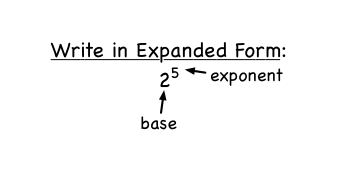 How Do You Convert a Number in Expanded Form into Exponential Form? Exponential form is a quick way to show that a number should be multiplied by itself a certain number of times. In this tutorial, see how to write a repeated multiplication in exponential form!